Small and Medium Business Owners Are Cautiously Optimistic About Sustainability in the U.S.
ATLANTA, October 11, 2017 /3BL Media/ - Today, Cox Enterprises released the results of the national Cox Conserves Sustainability Survey, which identified that small and medium-sized business (SMBs) owners are cautiously optimistic about sustainability in the United States. The survey, commissioned by Cox Enterprises, is a national study that examines SMB owners’ insights on sustainability. While many fear that sustainable practices in the country are in jeopardy, they are also hopeful based on the improvements they’ve made within their respective organizations. The survey found that 72 percent of respondents think we should participate in the Paris Climate Agreement. While an overwhelming majority (76 percent) believe in climate warming, female SMB owners tend to index higher than men in this area (81 percent versus 67 percent). When asked to select a song that best describes the nation’s current state of sustainability, the majority of SMBs selected We Can Work It Out by the Beatles. Compared to 2015, the 2017 survey showed that there has been a significant increase in the number of SMBs that have implemented sustainable business practices. In 2015, only 62 percent of SMBs had implemented some type of company or employee-based sustainability program. This year, the survey found that number has increased to 88 percent. Cox Enterprises is committed to environmental sustainability. The company’s national Cox Conserves sustainability program is celebrating its 10th anniversary. Since 2007, Cox has offset 82,000 tons of carbon, saved 57 million gallons of water through conservation and diverted 97,000 tons of waste. 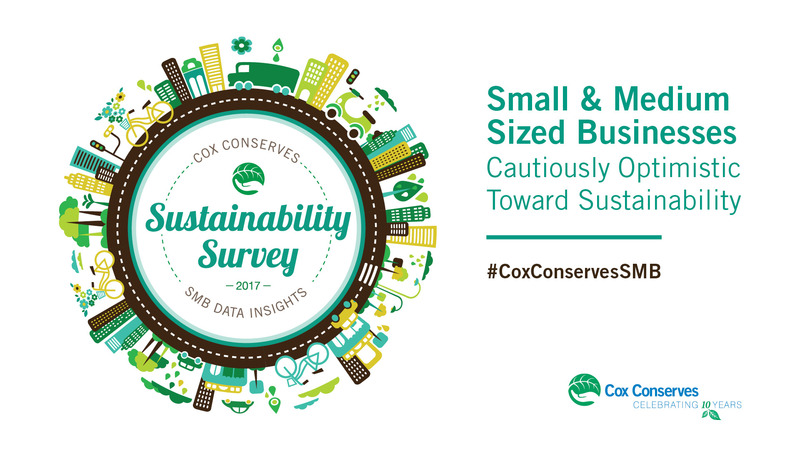 The Cox Conserves Sustainability Survey, commissioned by Cox Enterprises, is a national study that examines sustainability perceptions of leaders at small and medium-sized businesses (SMBs). The 2017 Survey was conducted in August among a national sample of 509 decision-makers of businesses with less than 1,000 employees. The Survey is part of the Cox Enterprises’ larger commitment to conservation and ongoing desire to further sustainable business practices. Cox Conserves, the company’s national sustainability program, is celebrating its 10th anniversary. Cox Enterprises is a leading communications, media and automotive services company. With revenues of $20 billion and approximately 60,000 employees, the company's major operating subsidiaries include Cox Communications, Cox Automotive and Cox Media Group. The company's major national brands include Autotrader, Kelley Blue Book and Manheim. Cox Enterprises has hundreds of thousands of SMB customers and suppliers across its companies, including more than 300,000 at Cox Business.